It's Apples Hardware, platform and Store. No developer it required to invest time or create applications if they don't want to. That Simple! First, you can't compare Apple and Google in this argument. Ownership has to come into play, and that distinction needs to be made. A developer doesn't have access to an iOS user without that person buying an iOS device. Only Apple makes iOS devices. So of course, Apple is going to have an advantage over 3rd party developers. Apple competes at the device level, so to be competitive, they have to include built-in software and features. Any developer with half a brain should understand that. On the other hand, Android is an open application platform. Developer/OEM to user relationship can completely bypass Google. Google interjecting itself into that relationship is where things can go bad. What it really boils down to; is governments are looking for more ways to steal money under the guise of taxes to spend it on themselves, and others that don't deserve it. What are you on about? This is primarily about access for app and news providers to the stores, discoverability and preferential treatment of Apple/Google apps in their respective stores. What the heck is a “Netherlands” competition regulator?! I thought that they were part of theEU, and there was already an EU competition regulator, Vestager? These people get to double-dip? What nonsense. It’s like ‘Vermont competition regulators’ going after Royal Dutch Shell. The US needs to go after and swat down these bozos aggressively. Are they valid concerns or are they just an attempt to break down Apple’s vertical model? More democrats demonstrating their intolerance for anything non-democratic. They’re not an Islamic state but I’m sure I saw some weapons of mass destruction last time I was there. That should do it. Show me the law or regulation that gives right to have an app in the AppStore. Then we may talk about conditions and how fair they are. Until then: my shop, my rules. You don’t like them, fine. Try elsewhere. I check the App Store everyday for the stories and top apps, etc. I've never seen them promoting their own stuff there. 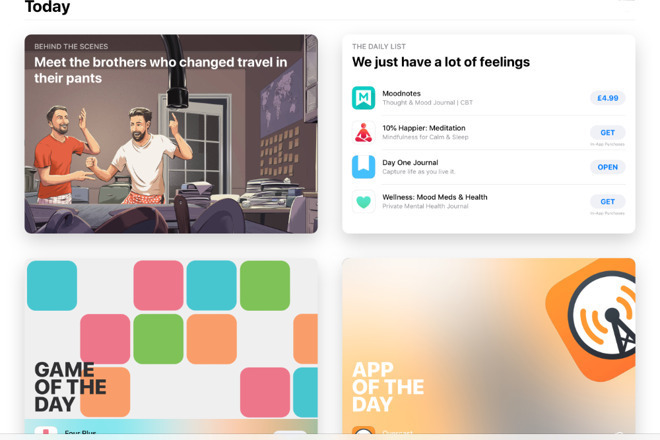 The "Today" section always has interesting stories and none of them are about Apple's apps. I can't recall a day when the "App of the day" was an Apple app. None of the curated "top picks" or "our picks" have Apple apps. I think Apple is trying it's best to expose all kinds of apps and games. Apple realises that continued developer participation is vital to the eco-system. Although many people (especially English speaking) use the name 'Holland', the more correct term is the 'Netherlands' as the country's official name is 'The Kingdom of the Netherlands. Comprised of 12 provinces, only two have the word Holland in them. I try to be correct when speaking to Dutch people but I was brought up using the word Holland so sometimes I slip up. On the other subject, each country can have its own competition body under the umbrella of EU law as all EU laws are transposed into national law and each countries laws are different in many ways (although they comply with EU law). Could be worth getting these blackmailers kicked out of the WTO.